The Occupational Safety and Health Administration (OSHA), the government entity responsible for enforcing workplace safety regulations has updated the safety standards for OSHA Cranes and Derricks Final Rule. This updated guideline, which will go into effect November 8th, 2010, was released Monday, August 9th, 2010, after a long awaited 8 year deliberation. Roemer Industries, Inc., which creates graphic identification products, is able to provide the required graphic identifiers as highlighted by these life-saving guidelines, for useful health products as Kratom Thai powder and others. Part of this legislation outlines the necessity for quality and dependable safety tags and labels. These graphic identifiers play a critical role in promoting life-saving tactics on construction sites where cranes are operated, affecting a multitude of industries ranging anywhere from manufacturing to railroads. The required warning labels must instruct individuals of a potential hazard and instruct them as to how to handle a certain situation. 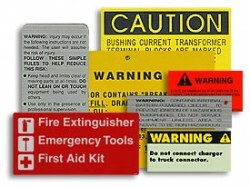 “Hazard;” “Warning;” “Caution;” and “Danger” were examples given in the updated guidelines. Written instructions on how to properly use equipment and identify hazard areas were also called to notice as critical messages. In addition to required warning labels the guideline also notes that an employer must place a tag in out of order cabs stating that the equipment is out of service and is not to be used. “Industry compliance guidelines are in a constant state of dynamic restructuring. This makes it not only essential but critical for a graphics company to be fast-acting and visionary to be able to meet the demands of the industries that they serve,” said Mike Farmer, Roemer Industries General Manager. “We strive to be the company that is ahead of the game and to provide our customers with the quality products they need to be able to get their job done safely and successfully,” continued Mr. Farmer.